Chief Justice Joel Bolger issued a statement Friday night saying the governor’s office doesn’t seem to understand what the Constitution requires when it comes to appointing judges. 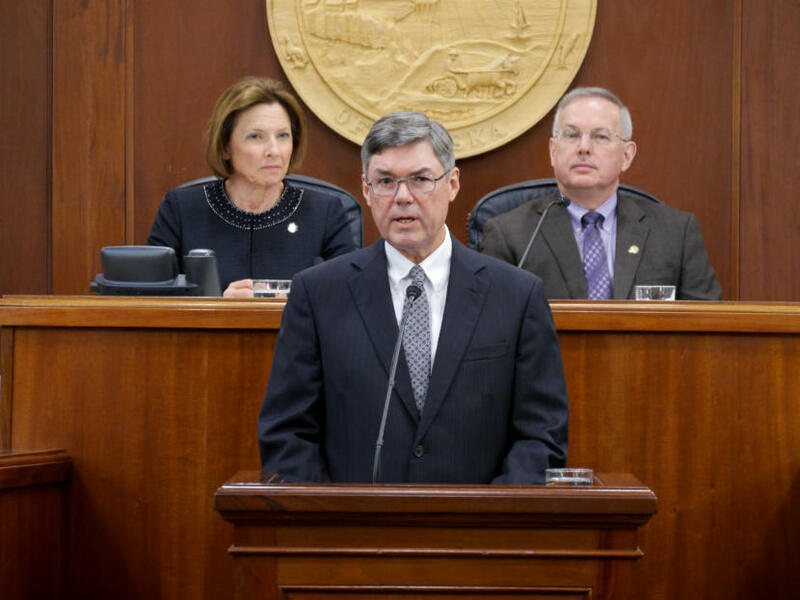 “The governor must appoint one of the candidates nominated by the council,” the chief justice wrote, referring to the Alaska Judicial Council. The council screens applicants for judicial vacancies and sends a list of nominees to the governor. Gov. Mike Dunleavy’s decision not to select anyone for one of the vacancies on the Superior Court puts the state in uncharted waters. The Alaska Constitution and state law say the governor has 45 days to appoint a nominee from the council’s list. Forty-five days have now passed. Judicial Council Executive Director Susanne DiPietro said it’s not clear what happens next. “Well, that has never happened before so I don’t believe that I can really answer that question,” she said. Eleven people applied for the two judgeships in Palmer. From that pool, the Judicial Council sent three names to the governor. Dunleavy wrote the council this week saying there appear to be qualified applicants that the council did not select and he wants to know why. DiPietro said the authors of the state Constitution intended the Judicial Council to be selective. “It’s very, very clear from their comments that they wanted the council to play a very strong role in screening the applicants and sending to the governor only the most qualified individuals,” she said. Dunleavy, in his letter, points out that the council passed over one applicant that it had previously decided was qualified for a different Superior Court vacancy. He suggested it shows the council’s decisions weren’t based on merit. Chief Justice Bolger, in his written response, said it’s not uncommon for an applicant to make the council’s list one year and be rejected the next time. It happened to him: The first time he applied for a spot on the Alaska Supreme Court, the council nominated him but the governor passed him over. The next time he applied, he was not nominated. Then in 2013, the council nominated him and Gov. Sean Parnell appointed him. Alaska’s system for selecting judges was designed to keep partisan politics at bay. DiPietro said the framers of the state Constitution intentionally limited the role of the governor. “The founders were very clear that the governor had the duty to appoint from the council’s list and that he does not have the authority to call for more names,” she said. The Judicial Council is comprised of three attorneys, three non-attorneys and the chief justice. The council met Friday evening to discuss the governor’s concerns. Two previous governors also questioned the Judicial Council’s selections: Wally Hickel in 1993 and Frank Murkowski in 2004. Those governors raised their concerns within the 45-day window. Each case ended with the governor selecting a nominee from the original list the council sent.